Law and Politics Book Review: WHAT'S LAW GOT TO DO WITH IT? WHAT'S LAW GOT TO DO WITH IT? 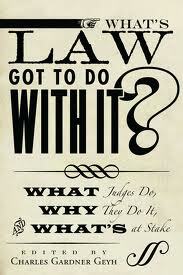 WHAT JUDGES DO, WHY THEY DO IT, AND WHAT'S AT STAKE, by Charles Gardner Geyh (ed.). Stanford, CA: Stanford University Press, 2011. 376 pp. Cloth $85.00. ISBN: 9780804775328. Paper $27.95. ISBN: 9780804775335. Reviewed by Staci L. Beavers, Department of Political Science, California State University San Marcos. Email: sbeavers [at] csusm.edu. Even just a few years ago, a project that would directly engage scholars from the disciplines of political science and law to draw together their traditionally opposing views on how judges reach decisions might have been written off as far-fetched. Yet this edited volume does that and more, even bringing in the perspectives of several sitting judges for good measure. Originally presented at a 2009 conference at Indiana University’s Maurer School of Law, the revised papers published here illustrate both potential intersections in the study of judicial decision-making from these respective disciplines as well as several gulfs remaining between them. Editor Charles Gardner Geyh's Introduction gets the volume off to a strong start, grounding the collection in the legal realism of the 20th century that helped to spawn several generations of political science research. Geyh notes that early, sometimes tentative, efforts to bring closer the respective disciplines of political science and law are now bearing fruit. He asserts that "at the turn of the new millennium, political scientists and law professors began unprecedented collaborations on a range of empirical research projects” (p.3). Other contributors pick up with this theme: for example, Eileen Braman and J. Mitchell Pickerill note with satisfaction the increasing numbers of legal scholars who are learning empirical research skills (p.117) as well as an upswing in the number of practicing social scientists who, like themselves, also have backgrounds in law (p.119, citing Posner 2008). Further, Professor Stephen B. Burbank notes a trend toward increasing citations of political science research in legal scholarship and in law schools’ hiring of political scientists for their faculties (p.45). In short, while for years many political scientists may have felt their tireless efforts to unravel mysteries of judicial decision-making went unappreciated even if not unnoticed, there is now real communication taking place between the disciplines. While several early essays meet the challenge of staking out disciplinary territory while also acknowledging common ground, several of the later, empirically driven chapters seem a bit out of place in this collection simply because they could so readily find a home in more “mainstream” political science journals. The more intriguing essays offered here are instead those that engage most directly with the stated aim of the original conference which spawned the book and that, simply put, are still less likely to be found in mainstream venues in either discipline. While Melinda Gann Hall’s empirically driven essay on judicial elections falls squarely within the more mainstream political science tradition as well, she acknowledges political scientists’ traditional reticence to address normative concerns as a [*93] weak point in the discipline’s examinations of the courts (p.225). More intriguingly, that Hall’s essay in support of judicial elections is immediately followed by legal scholar David Pozen’s direct critique makes for one of the most engaging exchanges of the entire book. Both scholars come out swinging from their disciplinary perspectives, with Pozen’s critique coming across as that of defense attorney tearing apart his opponent’s case. Editor Geyh’s Introduction expresses a bit of frustration that Pozen does not directly engage Hall’s social scientific evidence (p.10), and Braman and Pickerill note their own concern that these two scholars are essentially “speak[ing] past one another” (p.131). However, having these two sharply contradictory perspectives to lay side-by-side could prove invaluable as fodder for classroom discussions for students pondering the disciplines’ distinct approaches to such a critical policy debate. Geyh’s Introduction makes clear his goal of producing a book that could be of use to students as well as to scholars (p.13), and several additional chapters would tremendously benefit undergraduates being introduced to political science’s study of the courts. For example, Stephen B. Burbank’s “On the Study of Judicial Behaviors” provides a thoughtful critique of political science literature from his perspective as a legal scholar. Contributions by prolific political scientists Lawrence Baum and Jeffrey A. Segal provide helpful examinations of some of their own discipline’s competing schools of thought about judicial decision-making. Further, Barry Friedman and Andrew D. Martin’s “Looking for Law in all the Wrong Places” should be recommended reading for any political science graduate student contemplating a research agenda on the judiciary. Aside from sporting the volume’s most engaging title (at least from the perspective of one whose musical tastes lean towards Johnny Lee rather than Tina Turner), this chapter could well help direct political scientists to potentially productive lines of inquiry. Acknowledging their overall critique as one that is widespread among legal professionals (p.144), Friedman and Martin provide several suggestions for future political science research. For example, they urge a shift in focus away from both constitutional rulings and the Supreme Court and instead toward statutory construction as well as common law and other private law rulings by lower courts that in fact represent far more of the nation’s judicial decision-making. Light may be shed on why most political science research does not yet go into such areas with Braman and Pickerill’s discussion of “Path Dependence in Studies of Legal Decision-Making.” As they argue, scholars’ earlier decisions and experiences structure current expectations and alternatives. In particular, Braman and Pickerill explore how the disciplines’ distinct “criteria for success” (p.117) reinforce boundaries. For example, to advance professionally, scholars in each discipline need to publish in venues recognized and respected in their own fields, which requires conforming to internally established methods and lines of inquiry. Braman and Pickerill note that scholars of all stripes are “creatures of their training” (p.114), and this may help explain the lack of attention to judicial decisions outside the area of constitutional law that Friedman and Martin bemoan. For example, programs in political science frequently offer coursework in constitutional law while of course focusing students’ training on empirical methods, but many political scientists simply do not leave graduate programs well-positioned to research those areas of law that [*94] provide the vast bulk of the nation’s judicial caseload. Those political scientists who come from law backgrounds or who pursue legal training can be much better positioned to apply their empirical skills to broaden the scope of political science’s insights on the judiciary and maximize their own individual scholarly prospects. Braman and Pickerill's ideas here help make the case that aspiring political scientists could benefit by seeking training in law, perhaps by pursuing joint degrees. Despite gains in interdisciplinary dialogue, law schools are coming under increasing fire for the very developments that earn praise in this volume. Reports from January’s meeting of the Association of American Law Schools in Washington, D.C. documented harsh criticism of contemporary legal education, including its rising costs. In a speech at that meeting, U.S. Court of Appeals Judge José A. Cabranes directly criticized interdisciplinarity and joint degrees as merely diverting law students from gaining practical preparation for entering the legal profession while contributing to those increasing costs. Cabranes urged instead that law schools narrow their focus even further by chopping away a year of coursework (Mangan 2012). Whether continuing cross-disciplinary explorations can survive such efforts at streamlining higher education remains to be seen, but surely the social sciences would be losers under such propositions. The book’s conclusion is provided in the form of remarks by several sitting judges who attended the original 2009 conference. After listening to what must have been hours of presentations, U.S. District Court Judge Sarah Evans Barker’s statement that she felt “a little like a lab rat being analyzed” (p.337) was surely understandable. But it was Judge Nancy Vaidik of Indiana’s Court of Appeals who perhaps provided the most artful insight into the thinking of judges by acknowledging a limited but important range of judicial “discretion” as something to “celebrate,” comparing it to the slight but noticeable gaps in such celebrity smiles as those of Lauren Hutton and David Letterman (p.334). While not all of the book breaks new ground in terms of drawing interdisciplinary connections, the collection as a whole is worth a look for students and scholars from both disciplinary camps, but particularly for political scientists who are curious about how their own discipline is viewed “'from the outside'” (Braman and Pickerill, p.120). Mangan, Katherine. 2012. “At Meeting, Federal Judge Hands Down a Sharp Opinion About Law Schools.” The Chronicle of Higher Education, January 8. http://chronicle.com/article/Federal-Judge-Hands-Down-a/130264/ (accessed February 3, 2012). Posner, Richard. 2008. How Judges Think. Cambridge, MA: Harvard University Press. Copyright 2012 by the author, Staci L. Beavers.